This is the Transport I removed from my jag CD unit, I am using it as the guinea pig transport now :). Though this fix can be done without moving the transport, removal of the cover of the CD Unit will most likley make this a LOT easier. If you need help removing the cover checkout the first part of the CD Transport Replacement Guide which describes how to open the CD unit. 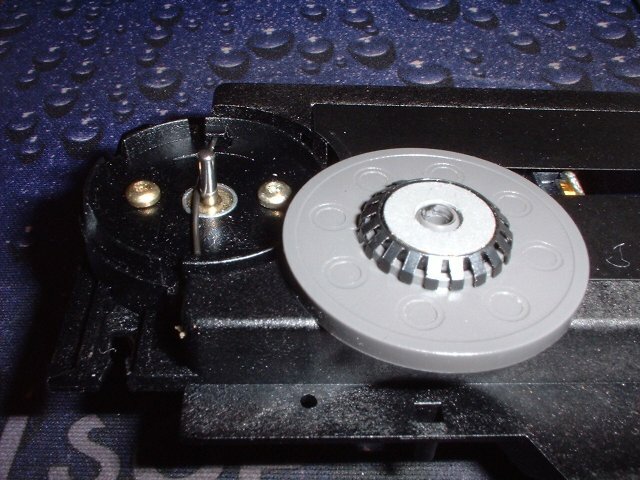 The logic behind this is that the platter slides down the motor spindle as time wears on until eventually it starts to rub on the plastic count for the motor and therefor disc's cannot spin at the right speed and everthing goes poo. So the logical fix is to slide it back up, I suppose you could do this by mounting your Jag and CD upside down for several years and use it that way, but I found that impractical, and the wife objected to having a console attached to the ceiling :), so the quick simple fix is to simply pull the platter up the spindle. 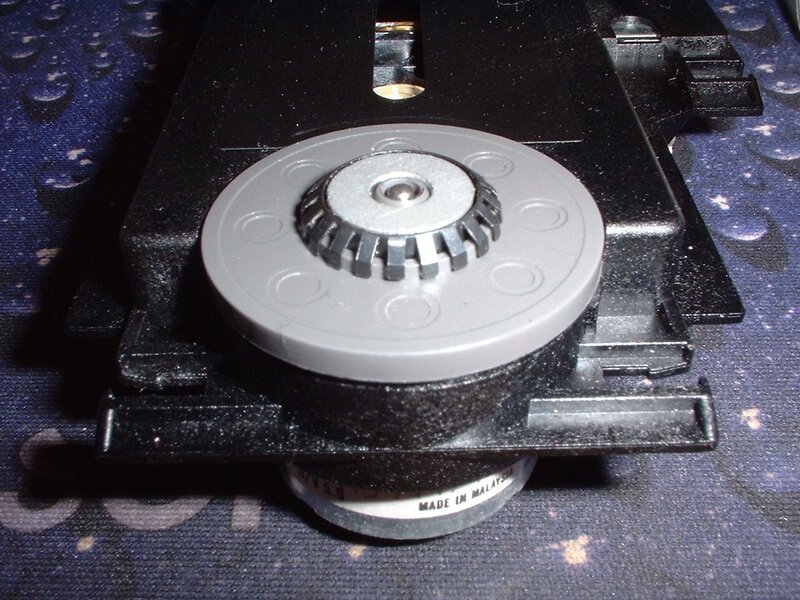 Simply hold onto the out plastic disc (grey in the picture) with your thumb and forefinger (pointing finger) and pull, it takes a fair bit of pulling, (NB try to pull against the transport (not the laser) by pushing down on the corners of the transport equally whilst you pull, otherwise you may damage the rubber suspension mounts that hold the transport in place, or just rench the whole caboodle off the mainboard). The platter is quite stiff and so can take a fair bit of pulling. Alternativley you can use a flat headed screw driver and in the groove under the platter twist the screw driver, rotating the platter after each twist of the screw driver to slowly edge it up the spindle. If you do remove the platter, no worries just slide it back onto the spindle, but not too far (And not too little). And thats that. Give it a try, you may need to slide it up a bit more or down a bit more for optimum results, but definately cheaper than a new transport :), good luck.